The Comet antenna has an effective power gain of 2, 10 watts in yields an effective radiated power (ERP) of 20 watts for example. This means whatever wattage reaching the antenna is effectively doubled. To double the distance of coverage the power has to be increased by a factor of 4. Radius of coverage assumes average flat terrain with an antenna height of at least 40 to 50 feet. This is a plug and play package set. Add an audio mixer, compressor limiter, microphones, etc. for a complete radio station. In many cases, with the proper hardware and software a computer system can provide most of these functions. Cue up a mix of mp3/podcast content, live streams, etc., feed the audio output from the computer to the transmitter and bring fresh voices, news/information and music to your neighborhood and community. Contact us to discuss your specific needs and requirements. 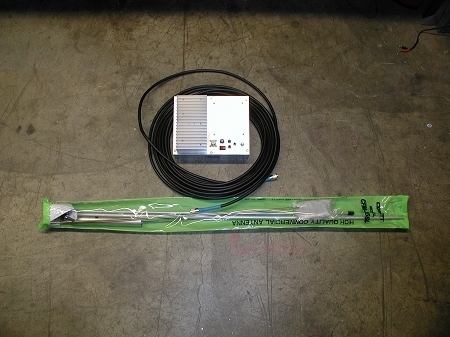 If you specify your operating frequency at the time ordering or prior to shipment, we will set the transmitter to that frequency and place a tuning mark on the antenna for you. To check frequency availability, take a look at this website. Or go to the FCC database - FM frequency search.